ARM TACKLES...yikes! Several players were in position to make the defensive stop; but, could not finish. Untimely penalty derailed a Terrier drive on way to points. Hope all the jitters or awestruck views are out of the way and the T-Dogs come back for a solid half of football. WDFM, good to hear from you. Stay away from Vegas...you can't beat the house!! AGREED NH Dude, would have lost today going against big dogs. Should have taken the points. Montana Griz leading No. Iowa in 4th quarter. They will be in Missoula next year, going to that game, wearing Wofford gear. Eastern WA took Bison to OT, but no luck. Big Sky very deep this year. 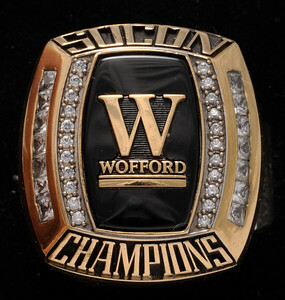 Hope Wofford wins SoCon and goes deep in playoffs. Superior speed will make arm tackles a necessity. We played just fine. Proud of our kids. We have nothing to be ashamed of. Another great article by Todd. We've said it before: our press coverage and game announcers are as good as any in the country. Glad to hear our guys are thinking in terms of improving some things. Here's a big problem: Third downs. "Ole Miss converted 10 of 13. In the first half, the Rebels converted third-and-9, third-and-10, third-and-11 and even a third-and-21." Our OL and DL shone in places. Real studs there. Butler exuding a quiet confidence. DBs showed some quickness. No doubt this game will be valuable to us down the line. BTW, this game set an Ole Miss home attendance record, likely to be broken next week vs. Alabama. Ole Miss is a very good football team, and perhaps they didn't play as well as they could have due to the short week but I would be a little concerned if I were them. A lot of passes they threw, easy quick screens and the like, they didn't complete. We also played very well against their run game, and though I'd like to commend our team, we aren't an SEC defense. (Confession: I only watched the first half). This compounded with how they played against FSU in the second half last week and you get the point. Both teams will do just fine going forward but I think if one team was farther from where they need/want to be, it was them. Ruckus wrote: Superior speed will make arm tackles a necessity. We played just fine. Proud of our kids. We have nothing to be ashamed of. There were a lot of arm tackles, but in most cases we were able to bring down the ball carrier, or at least hold him long enough to for help to arrive. The last few years, a lot of our arm tackles were unsuccessful. copy of the game if you didnt get to see it. I was very proud of the effort by the shorthaired dogs Saturday. As many of you have noted, we need some clean up on the arm tackles. I am sure there will be a few tackle circuits this week in practice. On a side note, I was impressed with the gracious hospitality by the Ole Miss fans in the Grove. Reminded me of a larger Wofford tailgate experience. I am sure that atmosphere won't be so warm this weekend when Alabama rolls onto campus! Having watched the entire game and listened to the announcers they were very complimentary and generous to Wofford. In fact, everything I heard about the reception in Mississippi was nice. Tom Hart and Andre Ware were the announcers, and they did a good job and very fairly represented Wofford as well as Mississippi. Evidently they are SEC announcers, not Ole Miss announcers.